With 86 years of history and around three-fourths of its business engaged in diabetes care, Novo Nordisk maintains more than 50 percent of the insulin market by volume around the world, thanks to its focused strategy. The Denmark-based company said that it will continue this approach in China, which is its fastest-growing market. "We have made a long-term strategic commitment to China, from building up our organization for sales and marketing to investing in local manufacturing and research and development," said Lars Rebien Sorensen, president and CEO of Novo Nordisk. Sorensen told China Business Weekly that the company's efforts in China are focused on diabetes, given poor public awareness about this chronic disease. Educating medical professionals and patients is a priority, Sorensen said. A diabetes-focused sales strategy helped the healthcare company obtain a positive performance despite the global economic downturn. Novo Nordisk generated year-on-year sales growth and operating profit increases of 12 percent and 38 percent, respectively, last year. The company has reported 29 consecutive quarters of double-digit sales growth. Sorensen said the figures in China were even higher, citing 30 percent sales growth over the last few years. "We focus on areas where we have leading expertise, so we are best able to develop new products and services. Our focus is our strength," Sorensen said. Novo Nordisk established a research and development (R&D) presence as a long-term growth strategy in the competitive pharmaceutical industry. Novo Nordisk in 2002 established the first R&D center in China built by an international pharmaceutical company. The center in Beijing was also the first facility run by Novo Nordisk outside its headquarters in Copenhagen, Denmark. The 70 professionals and 11 staff members focus on research and manufacturing capabilities as an important segment of the company's worldwide value chain, Sorensen said. 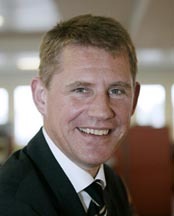 The company runs two similar facilities in Denmark and the United States. Novo Nordisk plans to double its activities at the Beijing R&D center over the next three years, making it a larger recipient of Novo Nordisk's global annual R&D investment of $1.5 billion. The China R&D center also partners with Chinese research institutes. The latest partnership is with the Shanghai Institute for Biological Sciences (SIBS) of the Chinese Academy of Sciences. The SIBS-Novo Nordisk Translational Research Center for Pre-diabetes in Shanghai will investigate new ways of predicting, preventing and treating diabetes with diagnostic tools, medicines and lifestyle changes. "The focus is on the early stages of the disease," said Wu Jiarui, vice-president of SIBS and director of the new center. "We hope we will discover bio-markers that will enable us to intervene early in the development of obesity and diabetes, as well as identify new drug targets and proteins relevant to the prevention or treatment of obesity and diabetes," Wu said. Novo Nordisk was founded in 1923 by a doctor who was the first to bring insulin to Europe to save the life of his wife. "Diabetes is a very complex disease, and there is still no cure. We are proud to be at the forefront of developing new approaches to address the unmet medical needs of people living with diabetes," said Sorensen, 55, a 27-year veteran of the world's largest insulin maker. The disease was first seen in developed regions such as the United States and Europe and is now spreading in developing countries such as China. Among emerging economies, China has the second-largest number of diabetes patients after India. More than 40 million Chinese people suffer from diabetes, and the number is likely to double by 2025. "The need is unfortunately becoming larger and larger. An increasing number of people will need medication and education," Sorensen said. Novo Nordisk set up a manufacturing plant in Tianjin in 1996. Late last year, the company announced an investment of $400 million to establish a new facility next to the old one. Covering 880,000 sq m and producing insulin cartridges for Chinese and global markets, the new plant is the largest single investment outside Copenhagen. The facility will be completed by 2012, creating 500 new jobs, according to the company. Novo Nordisk has built a sales team with more 1,600 staff members - three-fourths of its 2,200 employees in China. The company will expand its force by 20 percent in coming years. "We are expanding in China in all aspects to meet the growing needs for quality diabetes treatment." Sorensen said. China's pharmaceutical market grew at a compounded annual rate of 22.6 percent from 2003 to 2008, reaching $24.5 billion in sales in 2008, according to IMS, a US-based international pharmaceutical market research company. According to IMS, China already is the world's sixth-largest pharmaceutical market and will become the third-largest market by 2011. Such a large market is driving drug makers, including Novo Nordisk's competitors such as Bayer, Eli Lilly and Sanofi-Aventis, to gain a larger share. "We have two key advantages. 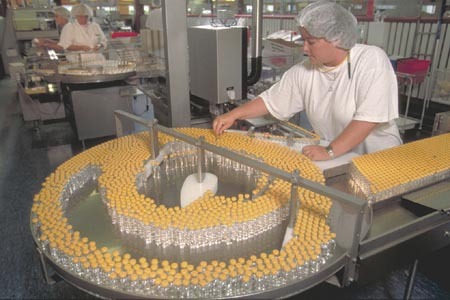 One is the large scale of production, which means that we can make insulin at a low cost," Sorensen said. "The other advantage is our R&D leadership that makes it possible to develop new and modern drugs," he said. Novo Nordisk is the only drug maker with a full portfolio of short-acting, mixed and long-acting insulin analogs, he said. China is the third-largest market for Novo Nordisk after the United States and Japan. Novo Nordisk also has been focusing on public and professional education in China as a way to increase awareness and the company's influence in this sector. So far, the company has helped train more than 150,000 healthcare professionals in China. Its public education and community initiatives include educational bus tours in rural areas. The company also supports high-level international meetings such as the Diabetes Leadership Forum, which was held in New York in 2007 and in Moscow last year. This year's meeting, hosted by the Chinese Ministry of Health and the World Diabetes Foundation, will take place in Beijing later this month.